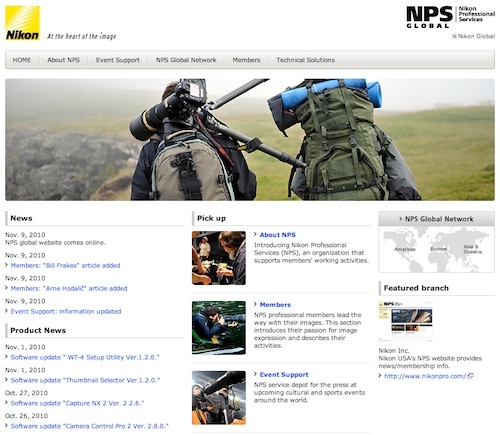 Today Nikon launched new global NPS (Nikon Professional Services) website located at http://nps.nikonimaging.com. TOKYO – Nikon Corporation is pleased to announce the launch of the new Nikon Professional Services (NPS) global website today, November 9, 2010. The new NPS Global site will serve as one of the measures in which Nikon reinforces its services for professional photographers. NPS is a membership organization through which Nikon offers support and services to professional photographers throughout the world. For nearly half a century, NPS has not only provided routine maintenance and repair services for professional photographers' equipment, but has also provided support for them at international events held throughout the world. With the expansion of Nikon's lineups of high-end digital-SLR cameras, NIKKOR lenses and other accessories, the NPS Global site has been developed to serve as a portal that distributes the latest information to assist NPS members working globally in their photographic activities. In addition to introducing an overview of NPS activities, the NPS Global site will offer members greater convenience. For example, it provides: links to regional NPS sites to find out about practical local information, local service facility list for photographers to visit when they face with equipment problems while they are on overseas assignment, and world-wide NPS service depot information. The site will also offer contents, such as the introduction of effective techniques for using professional equipment. All of these information can be accessed by professional and advanced amateur photographers who are not NPS members. As a manufacturer of imaging products that leads the professional industry, Nikon will continue to expand and enhance the contents of the NPS Global site and offer new services that fulfill user needs in order to reinforce its support and service organization. NPS is a Nikon organization designed solely to assist qualified, full-time professional photographers who earn their living using Nikon equipment. The organization is currently operating in approximately 30 countries with primary functions to provide equipment maintenance and repair services and to provide on-site support for professional photographers working at international events.